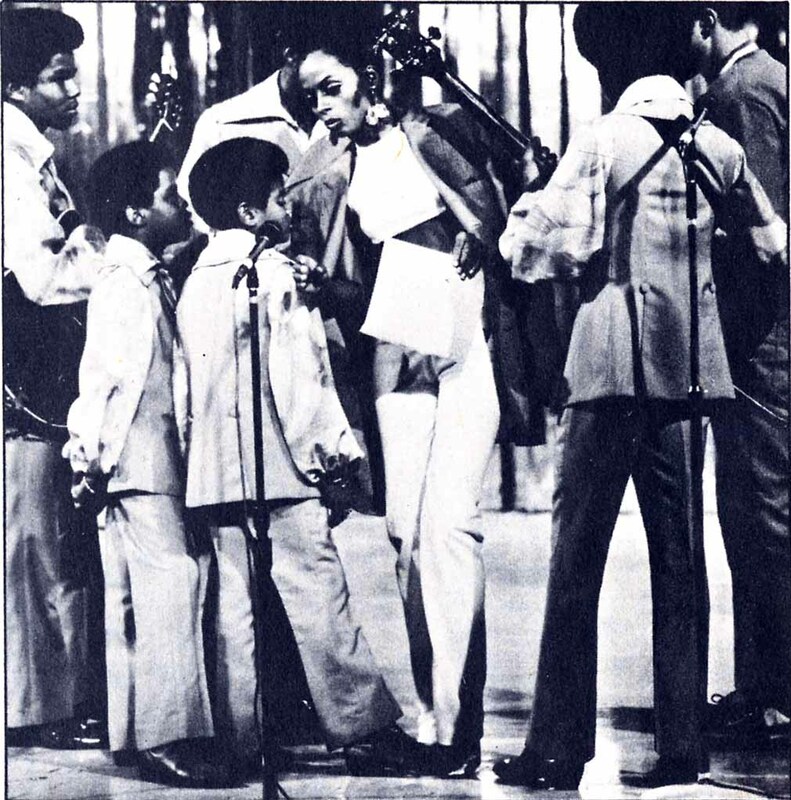 1969 - The Jackson 5 got their first* national television debut in U.S. on the ABC-TV show Hollywood Palace Special when Diana Ross introduced them. One week after I Want You Back was released, the Jackson 5 made their first national television appearance on a live broadcast of Hollywood Palace on ABC-TV at 9:30 p.m(EST). Diana Ross was serving as the guest host of a special show devoted to Motown acts. For their performance, the Jackson 5 did some fancy footwork to the first few measures of their exhilarating versions of Sly & the Family Stone's Sing a Simple Song (a cover song that was never released in its entirety, assuming the J5 did a studio recording of it, as they did with several songs by the Family Stone), and then sang a beautiful slow tempo song from their first LP, Can You Remember, a Delfonics cover. After a smattering of polite applause, Michael is barely audible when he introduces their next song - new debut single, saying: "Now we'd like to do our very first release on Motown. It's on sale everywhere!" and they tore into a blistering version of I Want You Back, their first live performance of I Want You Back, and about a minute into the song, you can see Michael begin to relax. Suddenly it appears that he is really enjoying being on stage and in front of a national audience. Watching it, we get a strong sense that we are witnessing a star being born. You might think little of the adult Michael Jackson but I defy even the most cynical to remain unmoved by the video of the Jackson 5 featuring Michael Jackson on the Diana Ross show belting out James Brown's There Was A Time along with Sammy Davis Jr. The pint-sized 11-year-old with the huge Afro and eyes to match, a big sweet voice and a determination to outflank Miss Ross in camera position, was already an experienced performer, though his grown-up moves were slightly off-kilter. He could simulate sexuality as he did a pretend ad lib but he was a kid all the same. 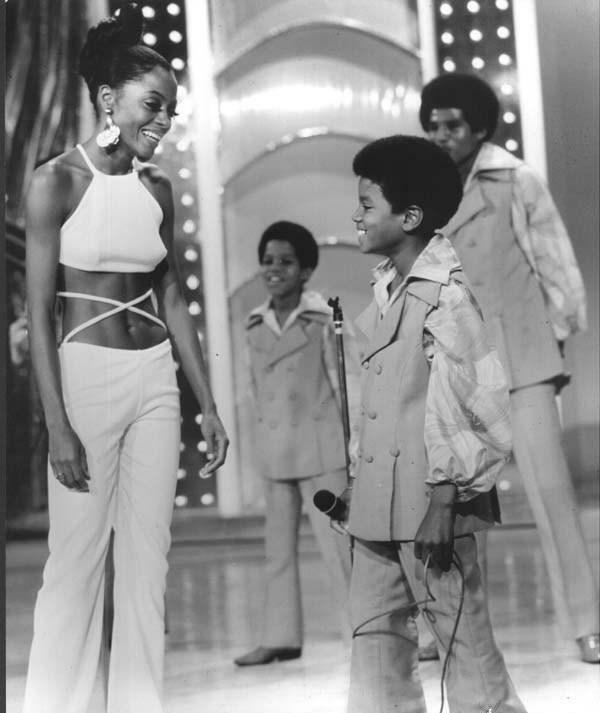 In their heavily scripted banter, Michael and Diana made several references to Michael's similarity to Sammy Davis Jr., and Sammy himself made a surprise cameo appearance to carry the the running gag one step further by pretending to be worried that Michael was going to take his place. In a way, this is a watershed episode of the past (Sammy Davis Jr. in a fit of mock jealousy over young Mike), present (Diana and the Supremes), and future (Michael and the Jackson 5) of African American entertainment. Besides Diana Ross and the Supremes, other guests on the show included Gladys Knight and the Pips and Stevie Wonder, but it was the smallest of these stars that night, the most dynamic as well, who stole the show from everyone. In fact, the line up was so remarkable, Motown put out a soundtrack album for it on March 1970. 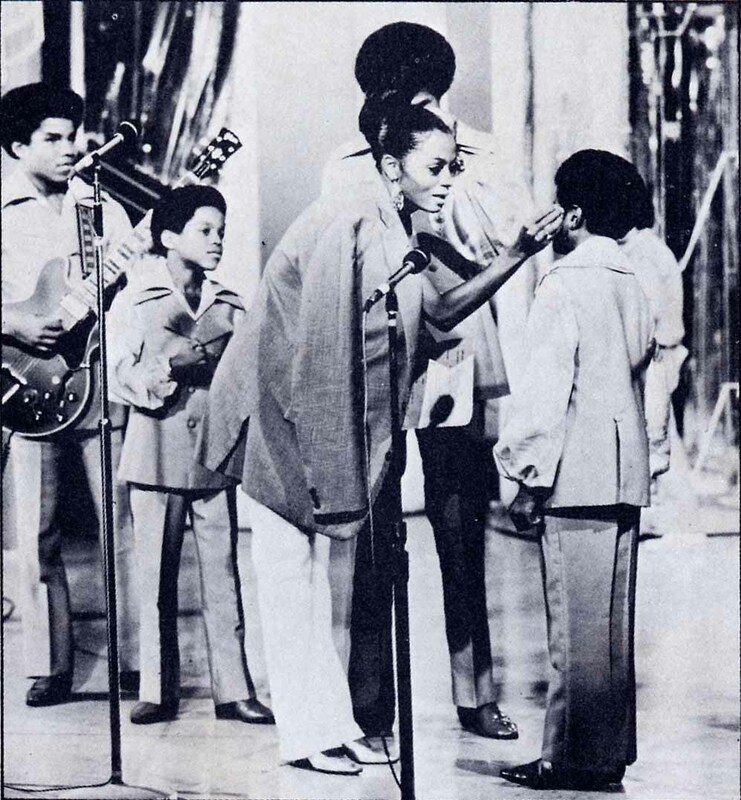 Motown had already been circulating the story that Diana had discovered the Jackson 5, so the show provided the perfect opportunity for her to introduce her young protegees. We all know the back story: Diana Ross got credit for the discovery because Berry Gordy asked her to "present" the Jackson 5 to the public, thereby launching their career and Ross's solo career in one fell swoop. Immediately -- and it may have had something to do with the language Motown used in their promotional materials, such as "the Jackson 5 were discovered by Diana Ross". This added an additional power of seduction including them public, and it was also a great enhancement of Diana Ross, who was preparing to leave the Supremes. The notion that Diana had a hand in grooming the young group for stardom was driven home by publicity photos showing her helping Michael with his stage make up... ...and in making certain the microphone was at just the right height for the lead singer. *The show is often cited in biographies, as the "first nationally broadcast television appearance," while the first was "Miss Black America" in August 1969. 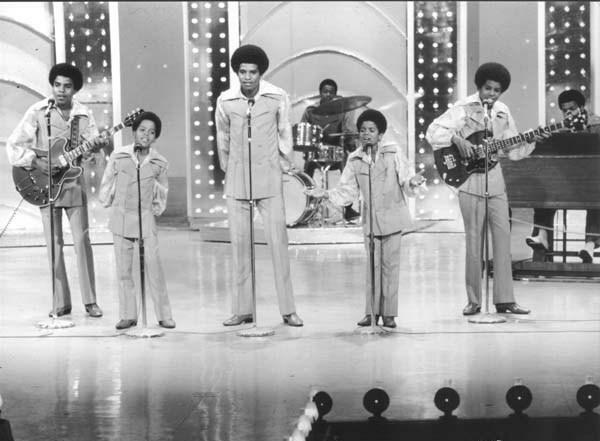 1970 - The Jackson 5 perform at Chicago, Illinois on their first national tour. 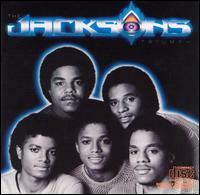 1980 - The Jackson's album Triumph hit #13 in the U.K. Triumph was the 13th album by The Jacksons, released in 1980 on Epic Records. It was certified platinum in the U.S. and peaked at #10 on the Billboard 200. Hit singles from the album were Lovely One, Heartbreak Hotel (This Place Hotel) and Can You Feel It. The Jacksons shared lead vocals and solo spots on most songs, but Michael Jackson handles most of the lead vocals. Triumph was the Jacksons' first album to reach #1 on the Billboard R&B Albums chart since Maybe Tomorrow in 1971. The album would sell over two million copies worldwide, and the Jacksons would not release another studio LP for four years after Triumph's release. 1982 - The Girl Is Mine released as the first single off the THRILLER album. The song hit #1 on the R&B singles chart and #2 on the Hot 100 in U.S, and #8 in the UK. "It started with Quincy Jones asking me to write a song about two guys quarreling over the same girl, and I thought about it and I came up with The Girl Is Mine." inspiration for writing the song, "and I went over to the tape recorder and I sang it into the tape recorder, and I sang exactly what I heard in my head, starting with the melody and the keyboard and the strings and everything. So I just orally put it on tape." other songs, and if any of them were similar to The Girl Is Mine, Michael replied, "Oh, yes, lots of other songs... they are mainly the same chords that I use in so many... That’s What You Get (For Being Polite) is one. Others would be Why Can’t I Be, Thank You For Life – all have the same main, the same type of chords as The Girl Is Mine. To prove his point, Michael sang The Girl Is Mine to an instrumental version of That’s What You Get (For Being Polite). 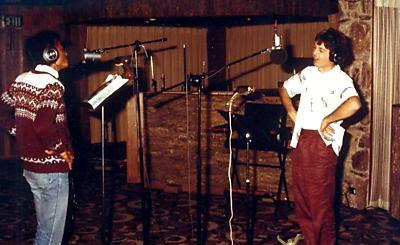 McCartney spent three days at Westlake Studios, Los Angeles, working on the song with Michael from 14th-16th April 1982 – the year after the pair first worked on Say Say Say and The Man, although it was the first Jackson/McCartney duet to gain a release. The single's cover photograph was taken by McCartney's wife, Linda. "One of my favourite songs to record, of all my recordings as a solo artist, is probably The Girl Is Mine, because working with Paul McCartney was pretty exciting and we just literally had fun... it was like lots of kibitzing and playing and throwing stuff at each other and making jokes... and we actually recorded the track and the vocals pretty much live at the same time, and we do have footage of it, but it's never been shown – maybe one day we’ll give you a sneak preview of it." Its lukewarm reception from fans prompted many industry insiders to presume Thriller would be a sales failure. They couldn’t be more wrong. 1988 - Michael performs BAD tour at Capital Centre in Washington DC [US]. 1993 - Michael arrives in Santiago(Chile) to perform a concert on October 23 at the Chile National Stadium. 2005 - Michael & his entourage leave London. This entry was posted on 18 October 2010 at Monday, October 18, 2010 and is filed under 1969, 1970, 1980, 1982, 1988, 1993, 1996, 2005 . You can follow any responses to this entry through the comments feed .